Founded in Cincinnati in 1955,A?The Isley Brothers are one of the few groups that have charted hits in five different decades. (from the late 1950s to the early 21st century.) They formed originally as a gospel group in Lincoln Heights, a small mostly black town just outside of Cincinnati. They moved to New York in 1957 and two years later wrote and released their first hit with the gospel-flavored stomper, “Shout,” In 1962, the Isleys and released another hit, “Twist and Shout.” The Beatles heard it and loved it. The then-little known group from Liverpool released THEIR version of the song and- – -as the saying goes- – -the rest is history. The Isleys, taking their cue from Jimi Hendrix ( who played guitar for a year or so during the mid1960’s in their touring band) and Sly and the Family Stone, truly help shape “funk-as-we-know-it” here in the 21st century. They are rhythm-and-blues legends and deserve many times over to be in the Rock-and-Roll Hall of Fame. 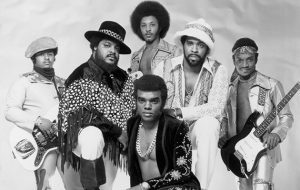 The Isley Brothers were inducted into the Hall soon after becoming eligible in the late 1980s. on tour. Rudolph retired and O’Kelly died of a heart attack in 1986. Must have releases from the Isleys include: “Three + Three,” “The Heat Is On,” and “License to Thrill.” Lead vocalist, Ronald, also branched out into a very successful collaboration with hip-hop crooner, R. Kelly, in the late 1990s. If you attend an Isley Brothers concert , you are likely Ronald’s hip-hop alter-ego, Mr. Biggs, on display during a segment of the show. Ernie still plays blazing lead guitar (Jimi, who taught young Ernie how to play nearly forty years ago, would be pleased). How many times will any group with their pedigree come to your town? See them while you still can!